PALM SPRINGS, CA – On Saturday night the Palm Springs POWER and the San Diego Force resumed Friday night’s game that was suspended due to a local power failure, and the POWER defeated the Force, 6-1. In the regularly scheduled matchup that followed, both teams combined to throw nine pitchers, and the POWER came out with the 10-3 victory, improving to 27-3 on the season. The POWER had a 5-0 lead with one out in the top of the sixth as action resumed in game one. Jose Garcia (SO, College of the Desert), who had faced only one batter last night, continued on the mound for the POWER. 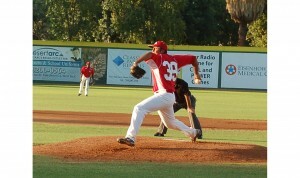 In all, he pitched three innings in relief to preserve the win for the starter Nick Baker (SO, California State University, Chico), who won his team-leading seventh game of the season. Five of the six runs scored by the POWER in game one came in the second inning. Frankie Torres (JR, Riverside City College), Sean Flanagan (SR, University of Iowa) and Hank Yates (college undeclared) each singled to load the bases with nobody out. Chett Zeise (SR, University of Iowa) then singled, driving in the first two runs for Palm Springs. Austin Barrett (SO, Mercer University) followed with a two-RBI double, making it 4-0 POWER. Curtis Gomez (SO, University of the Pacific) brought in the fifth run on a one-out single. Julian Esquibel (SO, Palomar College) got the call for the POWER in game two and threw five innings, allowing just one run on five hits. He struck out three and did not walk a batter, and improved his win-loss record to 5-1 on the summer. Scott Simmons (JR, Mt. San Jacinto College), Ryan Santhon (JR, California State University, Los Angeles) and Josh Pond (SR, California State University, San Bernardino) all saw action in relief for the POWER. Offensively, every starter for Palm Springs scored at least one run. Ryan Garvey (FR, University of Southern California) had a big day at the plate, with a single, double, triple and three RBIs. Marcus Romero (SR, Southern Utah University) went 3-for-5 with a double and two stolen bases (three on the day), Alex DeLeon (JR, University of Kansas) was 3-for-4 with an RBI, and Ryan Jones (JR, Ventura College) drove in two on the night. The POWER will take on the So Cal Athletics on Sunday in a battle of Southern California Collegiate Baseball League favorites. As always, Sunday is Bark in the Ballpark at the stadium, and fans can bring their dogs to enjoy the game. First pitch will be at 7:05 p.m., with the gates opening at 6:00 p.m. All POWER games can be heard live on www.PSPBB.com, with select games simulcast on NewsTalk 920 KPSI in Palm Springs. Also, be sure to check out our blog for more team information, including the lineups before every POWER game.